I adapted the lighting animation of our original Attacks from Mars project to create this wall piece. The painting theme references fifty years of science fiction styles and shifting robot identities, ranging from the Attack from Mars pinball machine to Star Wars, where both good robots and evil robots are either attacking or saving the citizens of our fair Cloud City. This piece was displayed as a part of the Luminous Garden show in Vermillion and in Skykomish. Painting in acrylic on plastic. Lighting uses arduinos and controllable LEDs. 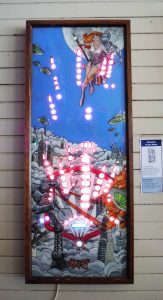 This art project was inspired in part our love for pinball, created as gift for Greg Larson. Greg is a pinball repair technician at Quick Pinball Repair, a Seattle pinball repair shop.